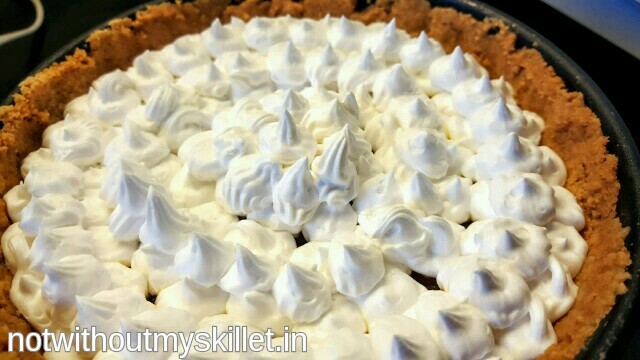 A chiffon pie is essentially a mousse like filling in a crust. I wanted to avoid eggs completely, and use custard, jelly and cream in my crust. 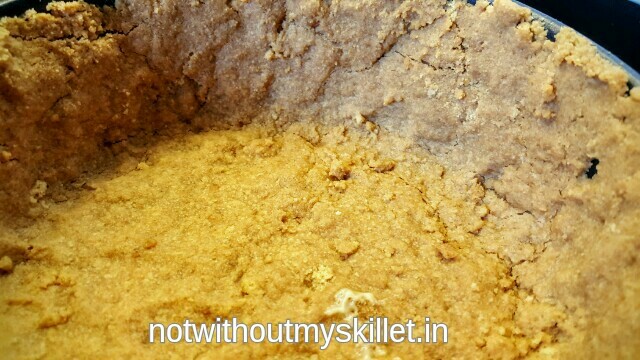 What’s more instead of a baked tart shell, I went back to a biscuit shell, making it super light and easy to make. It was however quite a heart-in-the-mouth moment when I slid the pie out of the springform tin, I wasn’t too sure if it would hold. But indeed it did. And did it wiggle and jiggle, almost like a waterbed! It was one of the most amazing desserts to cut into. 1. Crush the biscuits and mix in the butter to form a crumb like texture. 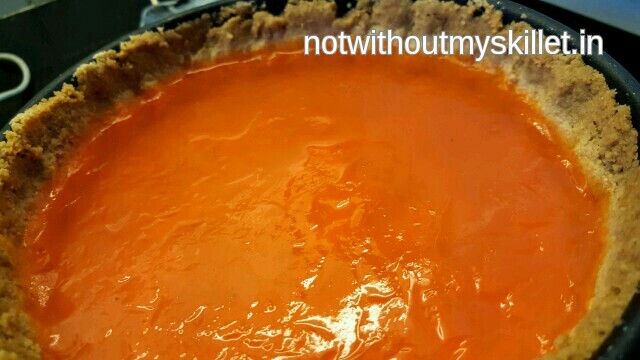 You will need a thickish base and side for this pie to ensure the wobbly contents don’t spill out. 2. Butter a springform pan and line the entire pan—sides and bottom with the mixture. Bake it for 15 minutes at 200 degree Centrigrade. Cool it. 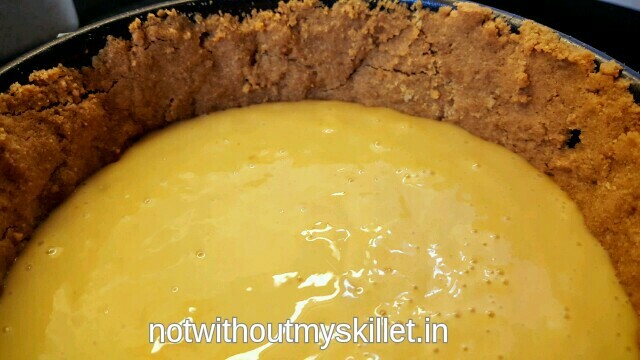 I love the orangey flavours of this custard. But you could go with plain jane vanilla too! 3. Make the custard, by boiling the custard powder and milk together. Make sure you keep stirring it, or the custard will burn at the bottom. I’ve used sugar-free thick cut orange marmalade jam to sweeten the custard to ensure that the orange taste runs through the layers. When the custard thicken take it off the flame and allow it to cool to room temperature. 4. Pour the custard into the lined tin and cool immediately. This will ensure the custard binds with the biscuit layer. 5. Now make the jelly as per manufacturers instructions. When done cool it to slightly above room temperature. 6. Now you need to pour the jelly over the custard. Use the back of a spoon to break the fall or else you will end up with craters on the surface of your custard. Cool to set immediately. As the jelly hasn’t set completely, it will bind with the top layer on the custard when it cools. 7. Meanwhile beat the cream to stiff peaks. Add sugar-free if using an unsweetened cream. I’ve used soya cream instead of dairy cream. 8. Just before the jelly is completely set spoon the cream over it. And let it set completely—above 6 hours will yield the perfect result. 9. Fill the rest of the cream in a piping bag. 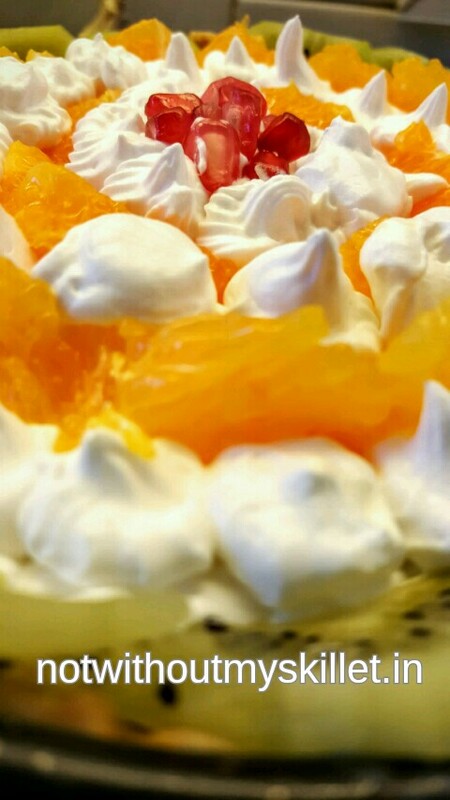 Now place the fruits in a pattern of your choice and pipe cream around it to finish your dish. 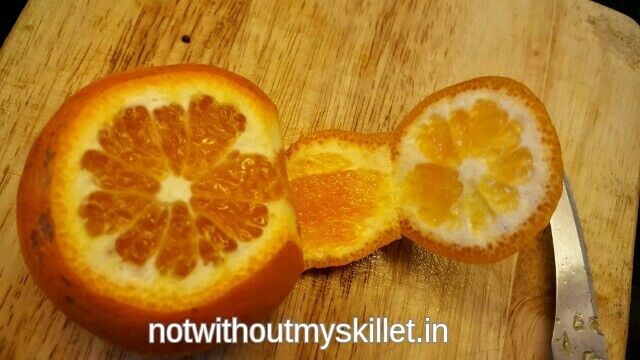 This is one of the easiest ways to peel and slice citrus fruits in one go! 10. Let it chill for at least 2 hours before serving. 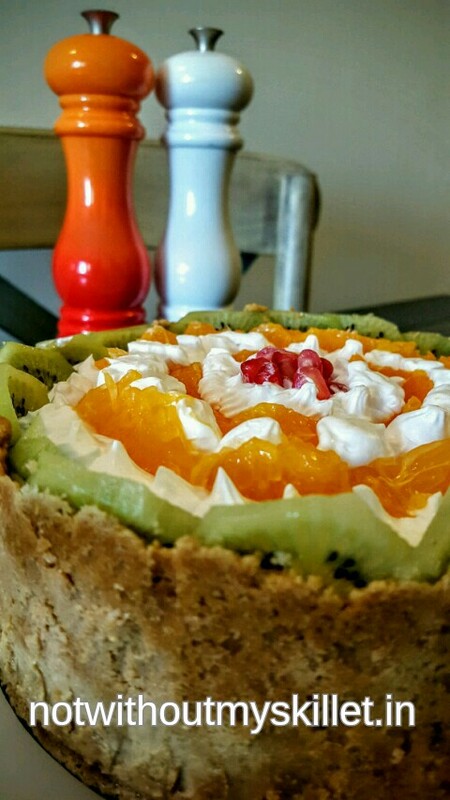 Note: I’ve used orange as a base for my chiffon pie, but you could use any flavour like strawberry or mango or even go with multi-fruit flavours. 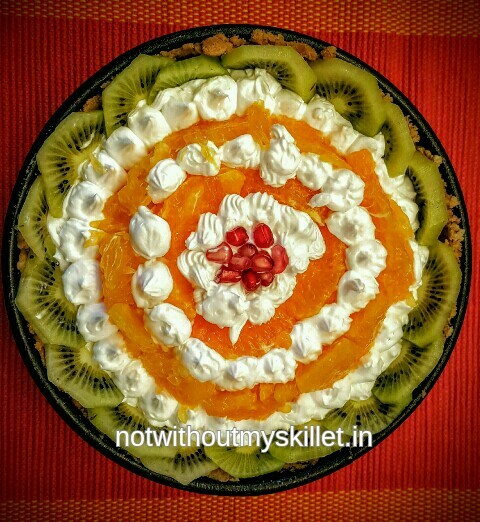 Use a variety of colours and seasonal fruits to enhance your pie! Just a question… 2 biscuits or 2 packets of biscuits?